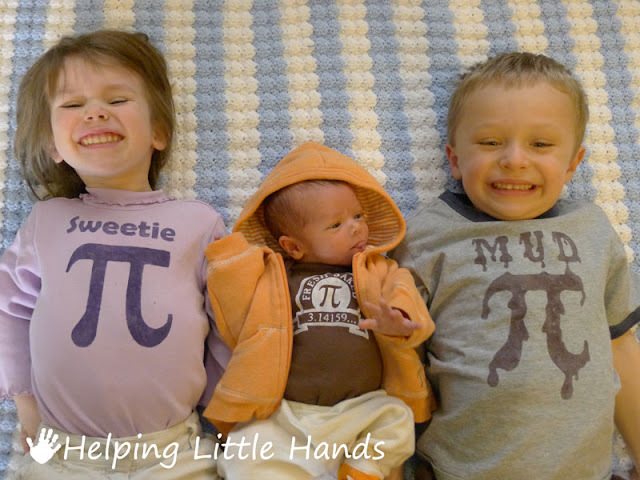 I thought I would get a Pi-Day post put up yesterday with cute pictures of the whole family in their Pi shirts and our yummy pie, so I didn't schedule a guest post as part of the Favorite Blogs Tour. But of course life gets in the way. Katie was home sick from school after throwing up in the night. She didn't wear her Pi shirt all day, and didn't even eat anything all day until dinner time. 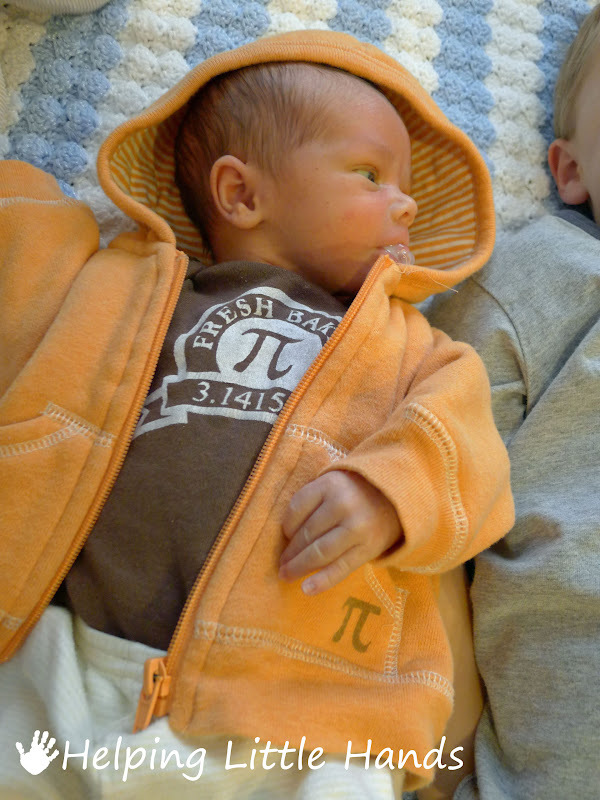 And we got a few of Anson on his own in his little Fresh Baked Pi outfit. 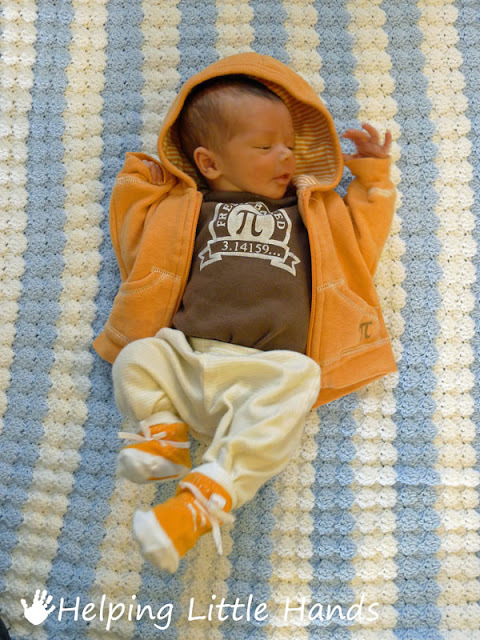 I put him in his Little Pi Guy outfit too, to take a picture. But he had his very first blow-out poop in it before we could take a picture, so he got changed back into this one. He looked adorable in it...but I think the sweatshirt drove him a little nuts since he constantly had something brushing his cheeks which made his little newborn suckling instinct go wild and he thought he was constantly hungry. And the pie I thought I'd get made in the morning wasn't ready until minutes before bedtime. I only "decorated" one pie after the kids went to bed, and the pumpkin pie just had to stay boring plain pumpkin. This is the Best Ever Coconut Cream Pie topped with toasted coconut in the shape of a Pi symbol...which was easy, but not as easy as I thought. So it might look even better next year now that I think I've figured out how to do it right. But we've been enjoying the left over pie today. It really is delicious. 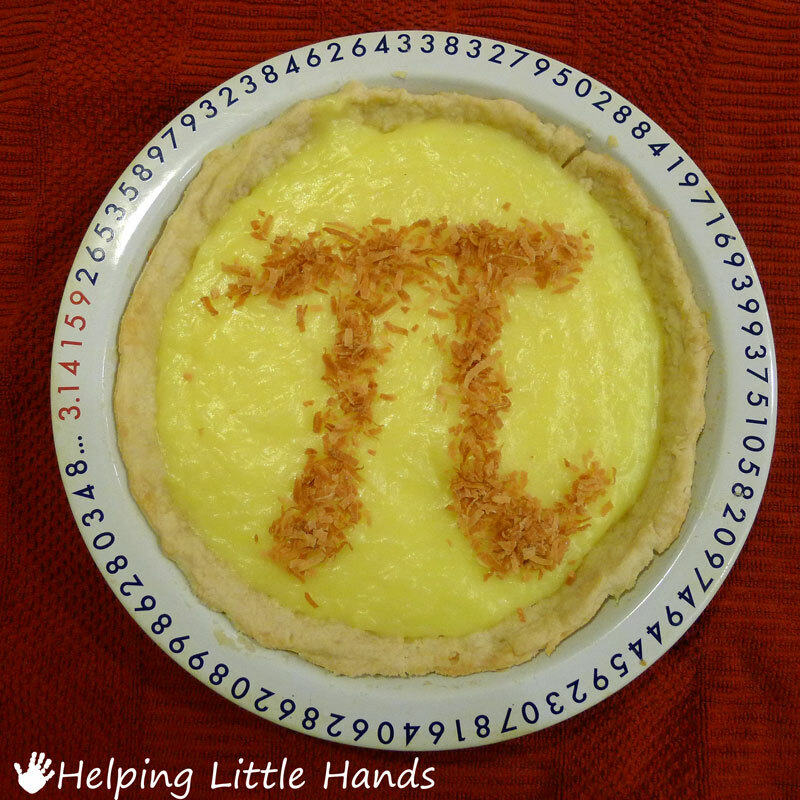 And if you're a little late celebrating Pi-Day, you might enjoy this little round-up of Pi-Day ideas. How about you? 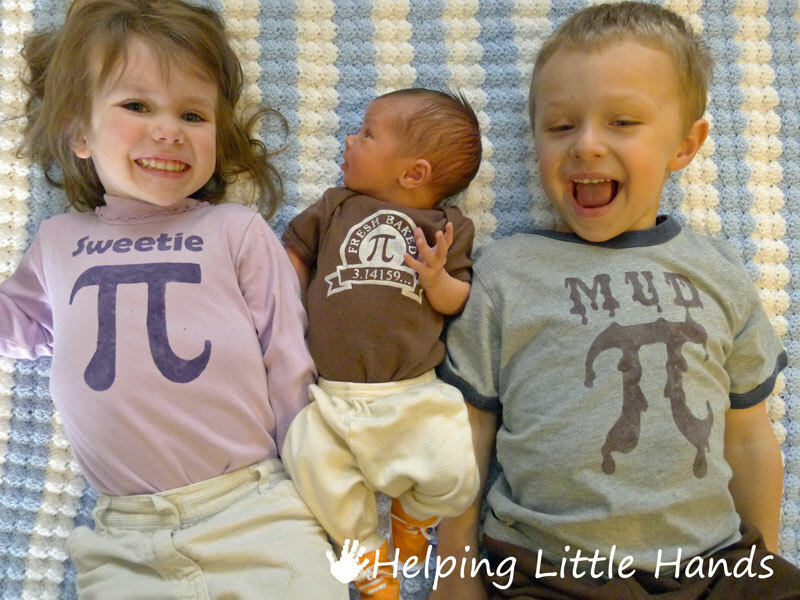 Did you celebrate Pi-Day? Update: And if you love math, you'll definitely want to enter my current giveaway for a Pi Necklace from Boutique Academia. The giveaway is open until March 18th at 12:00am. Love the shirts!! We made a pie--my daughter's first time to celebrate. Okay, I love the pi plate! And, fresh baked pi, adorable! How fun would it have been if he was born on March 14th? Maybe your next one will be :) Did you know there is a national PIE day, January 23rd I believe, we used to celebrate it all the time-- it should totally have been on March 14th, that would have made perfect sense (and been easier to remember). You organized woman you! Make sure to get some rest okay! Oh, and of course he had a blow out before you could get a picture-- isn't that always the way? 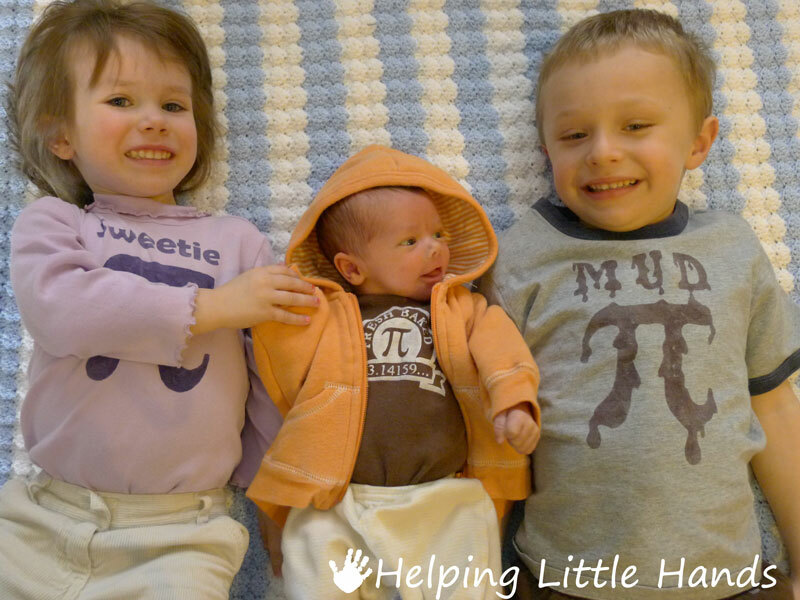 Anson is so alert and interacting with his sibs in these photos! What a little doll. I'm sorry Katie felt so crummy...good thing Pi day "circles around" every year! You can't go wrong with a holiday that combines math and yummy eats. Love the pictures of the three of them together! Anson looks a lot like your husband, it seems. I SO wanted to do stuff for pi day (inspired by you all of course) but I forgot. I saw those pi shirts on another website and loved them so I wanted to try to make them. I'm definitely going to do it for next year, though! I celebrated by looking at your blog! I got on two days ago eager for a pi-day post, but the wait was well worth it. And of course the pictures are great. Can't wait to meet the little guy.